There are four categories of suites at Biras Creek. They are known as Garden Suites, Ocean Suites, Grand Suites and Premier Suite. They feature KING beds, unless twin beds (two single beds) are specified. Three interconnecting suites are available to make two-bedroom, two-bathroom suites. For further information on the accommodation at Biras Creek please see the side menu. Biras Creek is located on the island of Virgin Gorda, but its position means that it is only accessible by helicopter or boat. Transfers from Tortola are included in the rate for stays of four nights or longer. All guests are met at Beef Island airport on Tortola and transferred to Virgin Gorda by private launch. Guests arriving to St Thomas can take a ferry to Tortola where they will be met by Biras Creek staff. The resort also has a helipad so guests have the choice of arriving to the resort from other Caribbean locations. 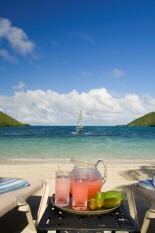 Luxury eco friendly resort, Biras Creek is located on Virgin Gorda in the British Virgin Islands of the Caribbean. This small and ultra exclusive boutique resort is recognized as one of the top luxury destinations in the Caribbean. Reachable only by helicopter or boat, Biras Creek is situated on a 140 acre peninsula between three bodies of water. Its situation between the enormous protected lagoon of North Sound, the open Atlantic Ocean and the Caribbean Bay offers guests a paradise for swimming, sailing and snorkeling at the edge of the resorts pristine and private white sand beach. Luxury resort, Biras Creek has just 33 luxury suites. All newly renovated, each suite features simple, sophisticated, comfortable and elegant décor and capitalizes on the outside beauty of the surrounding area. Spread through the resorts manicured grounds all suites offer guests privacy and seclusion in both inside and outside spaces. All of the resorts accommodation is set on the Atlantic side of the resort. This was done to maximize privacy while still offering guests amazing views. The beach on the Atlantic side is un-swimmable because of the sharp coral which means guests can relax on their beach front terraces, enjoy the view and not worry about being seen by beach combers. Biras Creeks main communal area is call the Hilltop Restaurant and Bar and its outlook over the North Sound offers fantastic ocean views. This communal area also houses the library, a TV room and sitting areas overlooking the bay. The menu features European and Caribbean dishes and varies from day to day. Meals are included in the nightly rates. Guests have a choice of gourmet buffet style breakfasts served in the hilltop restaurant or continental breakfast delivered to their rooms to enjoy on the terrace. Lunches are served daily on the beach BBQ style. The Fat Virgin Café serves snacks and light meals throughout the day. All rooms throughout the resort come with bicycles which is the preferred transport at Bira Creek. Guest can ride through the stone lined tracks to different parts of the resort at their leisure. The small beach cove is a short bike ride from the Hilltop Restaurant and the accommodation. The beach is adorned with thatch-roof umbrellas, underneath are luxurious sun-beds complete with drink flags should guests feel parched while soaking up the Caribbean sunshine. The beach has kayaks, windsurfers, Hobie Cats and Sunfish dinglies that guests can use at any time, and free lessons are also available. 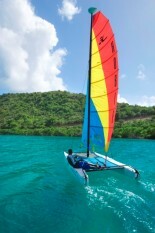 Guests can also take out a 26' Folk Sailing Boat. An outdoor massage hut is also located on the far end of the cove for guest wanting a massage by the ocean. Biras Creek’s private white sand beach offers a paradise for swimming, sailing, and snorkelling with complimentary usage of Boston Whaler dinghies, Hobi sailboats, snorkel gear and wind surfing equipment. Biras also has an abundance of other activities not based on the beach. There are about ten hiking trails on the property, ranging from 15 minutes to one-and-a-half hours. One trail leads to the famous Bitter End Yacht Club, which is well worth a visit. Biras also has a freshwater swimming pool that overlooks the Atlantic, introductory scuba lessons and two tennis courts. Complimentary bicycles come with every room. For additional fees, Biras can also arrange deep-sea fishing, motorboat excursions to nearby islands such as Jost Van Dyke and Norman Island, helicopter shopping trips to St. Thomas or St. Barts, water skiing and day or sunset sails on an exclusive sailing yacht.